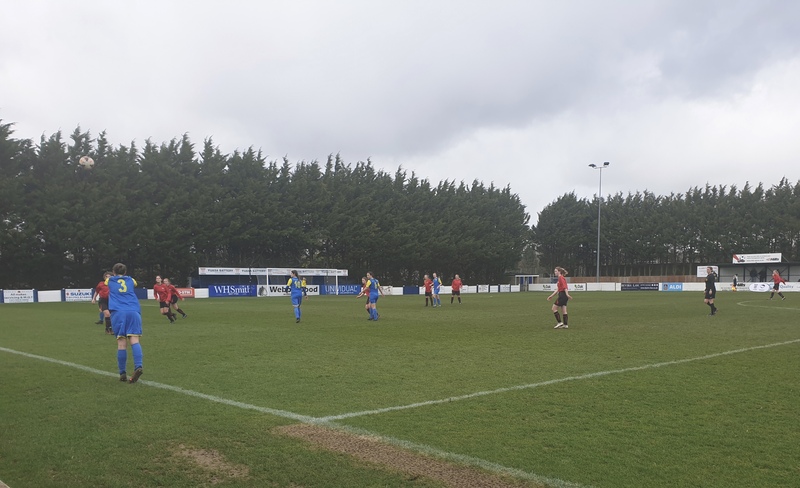 The 2019 Wiltshire FA Women’s Cup Final was to be contested at Webswood Stadium home of Swindon Supermarine. The two-time runners up in the competition Royal Wootton Bassett and 2017 champions Swindon Spitfires. 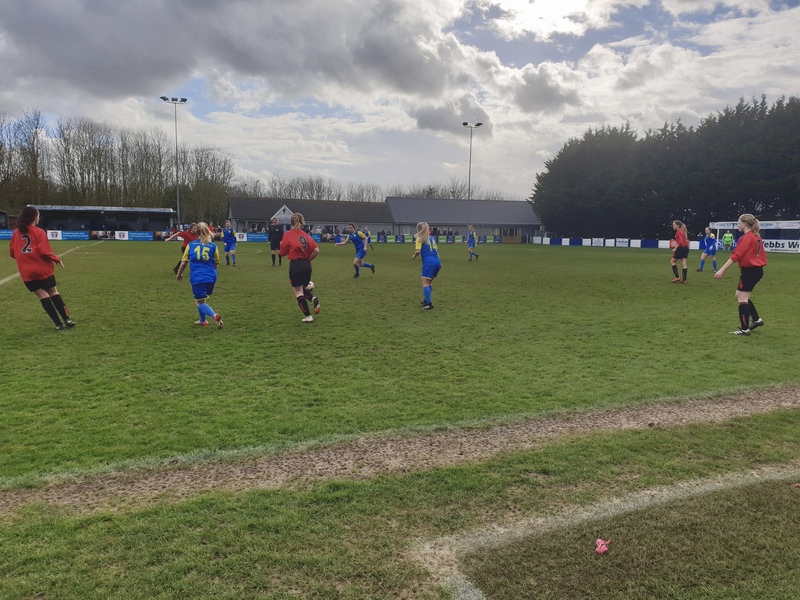 Bassett were favourites by virtue of leading the South West Women’s Football League Eastern Division, tier 6 of the women’s football pyramid. Spitfires currently occupy sixth place but inflicted Bassett’s only defeat this season. Spitfires had only played one match in this year’s Wiltshire Cup, a 1-0 win over Trowbridge Town in the semi-final following two byes in the earlier rounds, whilst Bassett had scored 24 goals in their three games in the tournament including a 15-0 demolition of Melksham Town in the quarter-final. A healthy crowd made up of mainly friends and family of the players. The players of the Swindon Supermarine were on hand in selling hot drinks to supporters in what was appreciated by many as it was a bitterly cold and windy afternoon. A match day program containing all the relevant information was available for one pound. Spitfires, playing in red, started the brighter with some crisp passes before Bassett in an all blue strip started finding their feet with their hugely destructive front two of Hayley Huckin and Emily Arrell who had already combined to score over 30 goals in all competitions this season. Arrell fizzed a shot across goal and Spitfires responded by causing problems of their own from the nimble-footed right-sided midfielder Claire Morton. Firstly with first a wicked shot from the left that was saved by Bassett keeper Abi Footner. Then two long-range high shots that swirled in the wind before going just over the bar and another hit the post. Bassett then started to up the pace with Arrell who had two very good chances, one which went agonisingly wide and another that was smothered by Spitfires keeper, Sian Barber. Bassett finally broke the deadlock on the half-hour mark when Arrell played a pinpoint pass from the right to Huckin who duly obliged and slotted the ball into the Spitfires net. Two minutes later the lead was doubled when Lauren Kayll picked up the ball on the left to score Bassett’s second. Huckin got her brace and Arrell opened her account by rounding the keeper to make it 4-0 and Huckin duly completed her hattrick just before referee Laura Morgan had time to blow the whistle for half time to give Bassett a 5-0 lead at the break. One wondered how Spitfires’ manager Diana George was going to rally her young team who were simply unable to deal with Bassett’s pace. Some supporters were still finishing their half time drinks when Arrell found the net directly after the restart and Kayll got her second & Bassett’s seventh two minutes later with a tight-angled shot. Bassett were simply rampant and Huckin passed the ball to Arrell for a tap in and for her to become the second Bassett player to score a hat trick in the match. At this stage with the game long over as a contest Bassett joint managers Jonny House & James Goddard made use of the rolling subs rule and made multiple changes giving some game time to the squad players including veteran club stalwart Kate Edwards and utility forward Zoe Shellard. Shellard was unlucky not to get on the scoresheet. As the game fizzled out to its conclusion Bassett were awarded a penalty in the dying minutes and up stepped Maddy Elliott to fire home Bassett’s ninth and final goal. 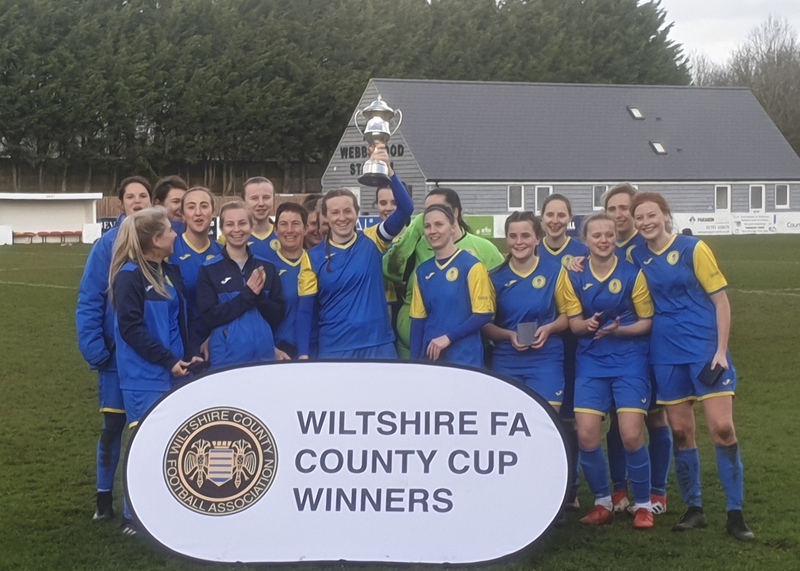 A pleasant presentation ended proceedings where both teams received medals before Wootton Bassett’s captain Laura Jefferies held the cup above her head in front of a jubilant contingent of her supporters as Bassett were crowned Wiltshire champions for the first time. As disappointed as Swindon Spitfires were after this heavy defeat they must take solace they are a very young team and will learn from this and come again. Bassett, on the other hand, will hope there is another cup to add to their trophy cabinet with the league championship to come & promotion to the fifth tier of women’s football and they are very handily placed to do so in what will cap off a memorable season for this highly talented and enthusiastic team that plays football the right way.